The Council approved (4-1 with Mayor Pro Tem Shea opposed) another 1,056 market rate homes for FivePoint based on a request they made to the City back in April of 2018. FivePoint recognized a policy “interpretation loophole” in the General Plan and acted upon it. This policy language was cleaned up by the Council after granting FivePoint this approval (see the last bullet). To date, 3,200 families live in GP neighborhoods. There will be a total of 10,556 homes built. City staff reported that the infrastructure capacity and environmental impact would not be negatively impacted. 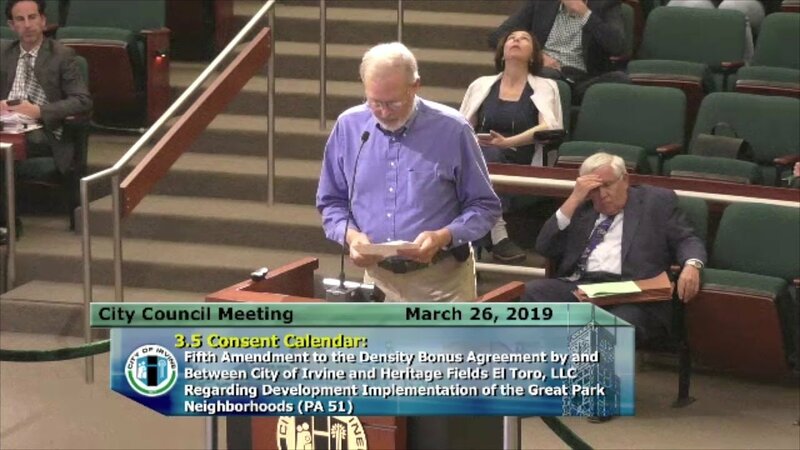 Councilmember Khan asked FivePoint Representative, Patrick Strader, to make the homes affordable (in the $500k range) and to set aside some of the new homes for Irvine city staff, Irvine police officers, and Irvine teachers so they can work where they live. She stated she will be reviewing future development projects in the GP neighborhoods to make sure her request is met. the developer’s involvement in the golf course site construction and land transfer is decided. The Boarding House Ordinance was pulled from the Agenda at the request of the City Manager for further review and study. It should be back before the Council in September at the latest. The City Code Enforcement office will continue to enforce the current zoning codes. Students and residents came out to provide public comment and both want to see this item come back before the Council sometime soon. The Council voted (4-1) to modify The General Plan Land Use Element language regarding the additive housing policy for residential and non-residential development. Councilmember Fox felt the policy was fine as stated. The Council amended the language for clarity in the master planning process. Additive requests must be made upfront in the planning process and the combination of density bonuses and additive benefits is prohibited. The practice of “double dipping” does a disservice to the policy and going forward will not be allowed.